Like many middle-aged empty nesters, my wife and I are passionate about our much beloved and terribly spoiled pets. Our friends know they have to at least pretend to be interested when we share cute cat stories (gentle readers, I will spare you the details). Yet no professional in my life, including financial professionals, has ever asked me a single question about my pets – or even if I have them. Pet names are just one example of a larger challenge. Too many advisors still look at their clients as portfolios instead of people. But as traditional investment advice becomes increasingly automated, successful advisors will have to be passionate about building authentic, caring, even profound, relationships with their clients. To do this, you have to understand what is most important in clients’ lives. Consider your best clients….Do you know their hobbies, favorite charities, schools attended, names and birthdays of children and grandchildren? Do you know their greatest passions? Getting this information has never been easier. First of all, a good, life-focused discovery process should uncover many of these details. Social media sites such as LinkedIn and Facebook also offer incredible insights and perspective on what matters most to clients. But knowing this information is not worth much unless you actually do something with it. Do you put it in your CRM? Do you implement an email plug in such as Outlook’s Social Connector that allows you to see social media activity of clients you are connected to? Do you use this information to connect with clients, to show you care, to better advise them? Do you spontaneously, but deliberately, send clients items of interest about things they care about? Do you send their grandchildren birthday cards? How about gifts that really reflect their interests (instead of one more generic box of chocolates). Be original. Be creative. For example, if your client is a big fan of college sports, why not send him a toaster that brands his school logo onto toast : http://www.fanatics.com/COLLEGE_Logo_Toaster. Every morning that client will think of you. And if my advisor sent me (and I’m not hinting at all here) food bowls inscribed with my cat’s names, I’d be touched and grateful…and I’d tell friends about it. Finally, successful relationships are not one-sided. To really build rapport with clients, you have to share details about your own life, interests and passions. You have to be real and open. You have to be yourself. It may not always be easy, it may even feel awkward sometimes, but great, long-term relationships require us to share honestly of ourselves. So in the interest of full disclosure, my cats’ names are Fergus and Fenimore. I once had to hire a cherry picker to rescue Fergus from an 80-foot tall tree. 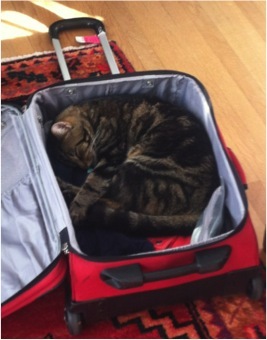 That’s him on the left, asleep in my suitcase. This entry was posted in Behavior Management, Marketing, Practice Management and tagged clients, communications, Investor Behavior, Marketing, Relationships, Value Proposition. Bookmark the permalink. ← What did Commodities Return in 2014?